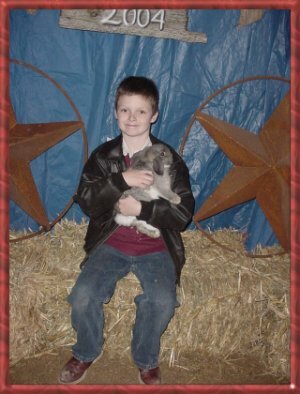 Circle L Rabbitry was established in the late 80’s by our youngest son Jeff. He raised a number of different breeds over the years, but the Hollands were always his special love. 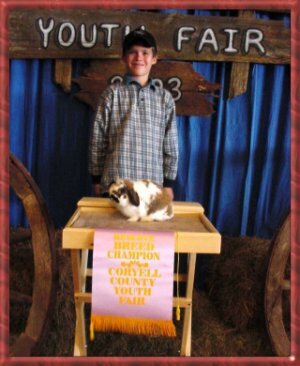 His first pedigree Holland Lop buck, a little tort named “Charlie of Hill Top”, lived to be over 9 years old. 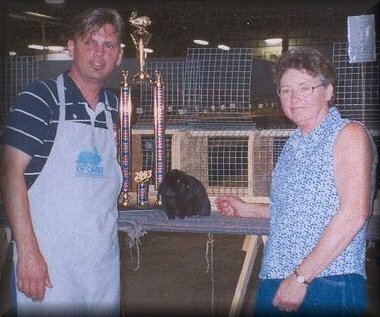 Jeff’s greatest achievement was winning BOB at the TRBA Youth State Show in 92 with a little black Holland Lop buck named Blackjack. Of course after he left to go off to college, as it seems to happen to so many of us, mom Sandra (that’s me of course)	took over the buns and by late 94 the barn was exclusively HOLLANDS!! My late husband Rich soon got tired of being left at home, and was my bunny chauffeur and gofer as he called himself for years. I am still located in central Texas, on 30 acres in the midst of oak trees, cedar trees, rocks, and the occasional rattlesnake near a very small country town called Lometa. I raise most of the usual Holland colors, but through the years my show herd has mostly been tort or black, with an occasional blue tort or chestnut or chin, along with brokens of those colors. The past couple of years I have made it a point to put lots more color (especially chestnuts) on the show tables, and soon saw my first BOB/BOS win with 2 chestnuts. My personal favorites are the br blacks and the chestnuts. One of my old tort lines goes back to the original doe Jeff started with in 88, and a lot of my tort herd will carry that breeding somewhere. My first place BJB at the 97 HLRSC Nationals, Circle L’s Knockout, was a 5th generation Circle L, and my first place BSD at the 01 HLRSC Nationals, Circle L’s Flame, is a 6th generation Circle L. I bought a little chestnut agouti buck in Tulsa in 94 who had a wonderful disposition, and used him to establish my color line of agoutis (chestnuts, opals, lynx, chins, squirrels). 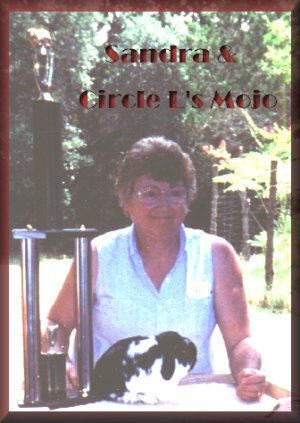 My 5th place BSB at the ARBA Convention in 98, Circle L’s Mojo, is out of that original chestnut buck. More than 50% of my barns now are devoted to COLORS. Torts, blue torts, sable points, siamese sables, and blacks, plus chestnuts, chins, opals, squirrels, lynx, fawns, and oranges can be seen in the barn. It seems like there is just always something new in the nestbox to keep you excited about when you raise the agouti colors!! I cull hard for type, disposition, and genetic hardiness. I will not keep a Holland that bites, and I will not keep an unhealthy Holland. I think the one thing that would describe my Circle L Hollands is simply balance. I have always been big on body and bone, so my Hollands must be smooth and well filled. Yet my bucks are so often commented on for their massive heads. I think the bone on my Hollands is obvious by looking at the width between their front feet, and by the massive look of their front feet. Those little short fat back feet are also a part of that. I think as many Holland breeders strive now to get that up pose they are losing the nice bone Hollands were once noted for. I attended my first HLRSC Nationals in 96 and after my SJD, Circle L’s Fancy, placed 2nd in both shows, we were hooked for good!! I have attended a number of HLRSC Nationals, and 2 ARBA Conventions, and I am already planning to go to the next HLRSC Nationals. I am very proud of how Circle L Hollands have done in national competition….…. 99 was our dream year, with our first BIS, the HLRSC Youth Natls first place BJB, 2 different Texas youth BIS’s and a Texas open BIS with Circle L Hollands, plus a 5th place HLRSC national sweeps placing, along with a 3rd place national Q points and 3rd place Herdsman placing. Due to my health and family circumstances, the 2001-2002 year was the first year I was not able to attend enough shows to place in the top 20 nationally. I have always been especially proud to be able to place in the Top10 in Herdsman, and think with drastically reducing my herd, and now not being able to make as many shows, I will miss that honor the most. 2000 -2001 national HLRSC results saw our first Top Lop placing with Circle L’s Tater Tot , the 6th place Youth Top Lop, a SSB then owned by Texas youth Whitney Carraway. 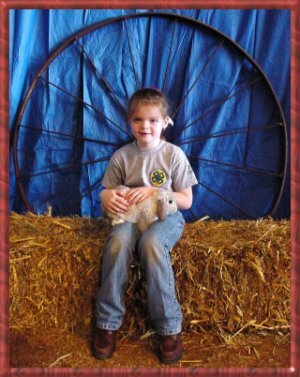 Circle L’s Cowboy, a BSB, owned by Brandy and Justin Hall of TX, was the 3rd place 2001 -2002 Youth Top Lop. 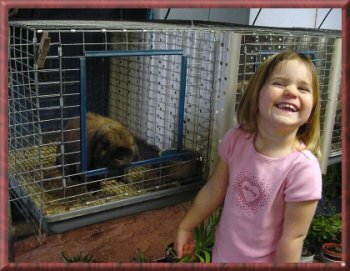 Although I belong to ARBA, TRBA, and HLRSC, our Texas Holland Lop specialty club (THLRSC) has been my focus over the years. I especially love working with our youngsters, and seeing their progress over the years. With the burning of our home in Feb 2000, our world changed overnight, and the buns went on the back burner for quite some time. But thanks to the support of our family and many friends, I soon got back on track breeding the buns and began showing again, although just not as much. We made a flying trip home after Holland Nationals in AZ in Mar 2001, to be on-hand at the birth of our first grandbaby, Sara Katherine Luning (daughter of Jeff and his wife Deanna), and soon became doting grandparents!! With the addition of 3 step-grandkids, Cara, Layne, and Cole Lovorn, and another daughter-in-law (with the marriage in early 2002 of our oldest son Brian to Lynn), we really found our lives and priorities changing immensely. In the late spring of 2002 after my dad’s long illness, we finally made the hard decision to half our large herd to make it more manageable for us, and also enable us to spend more time with our new grandkids. After my husband Rich’s sudden death in Nov of 2002, I thinned down even more, and simply didn’t have the time or much interest in the buns for quite some time. I only made a few shows in 2003, but getting BOB and then RES BIS with a wonderful SJB at our big TRBA State Show under judge Randy Shumaker, and then getting a double BOB with a young BSB at one of our double Holland Lop specialites, has shown the quality of my Hollands is still there. Sandra and Circle L's Jalapeno, SJB, who was the RES BIS at the TRBA STATE SHOW in 2003, with BIS Judge Randy Shumaker. My love for Hollands continues and will always be a work in progress!! The challenge of raising the newer up type, especially in the colors, is still ongoing. I feel like I have established a reputation over the years for selling QUALITY stock at REASONABLE prices, and pride myself on picking out the right Holland for the right person. I have placed Circle L Hollands in a number of states, plus Canada and Japan . I LOVE TO TALK HOLLANDS, so contact me if I can help you with any questions you have concerning Hollands. I will always remember the many rabbit raisers all over the country who supported and kept me going with their friendships and love during the trying times of losing our house, then losing my dad, and then suddenly losing my husband Rich. with her favorite kissy-kissy Holland, Chase. at the Coryell County Youth Fair in 2003.
the first place SJB at the Coryell County Youth Fair in 2004.
at the 2004 Coryell County Youth Fair.